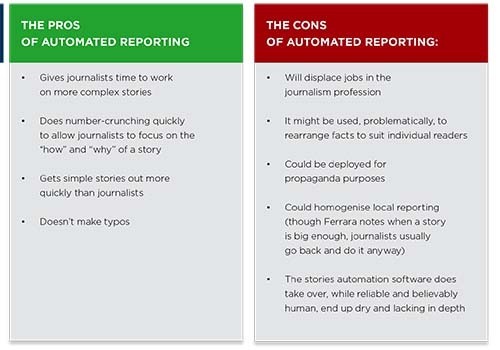 The example is funny and scary: A robot writes literature, akin to churning out copy for news organizations, thereby eliminating entry-level newsroom jobs and alarming future journalists. "When I in dreams behold thy fairest shade. Whose shade in dreams doth wake the sleeping morn. The daytime shadow of my love betray'd. Lends hideous night to dreaming's faded form." An excerpt of a poem written by machine-learning app Swiftkey after being fed a dataset of Shakespeare's words. The Associated Press (AP) hired an automation editor, and last July announced it would fully automate its corporate earning reports, according to "Trends in Newsrooms 2015" released this week by the World Association of Newspapers and News Publishers (WAN-IFRA). It worries analysts who see it as a blow to professional, thoughtful journalism, leading to further cutbacks in reporting and/or editing jobs. But proponents argue it gives journalists time to work on more complex stories and that it doesn't make typos. This and other trends are leading newsrooms worldwide to adjust to major disruptions, breakneck innovations and unprecedented pressures -- but are they keeping pace? 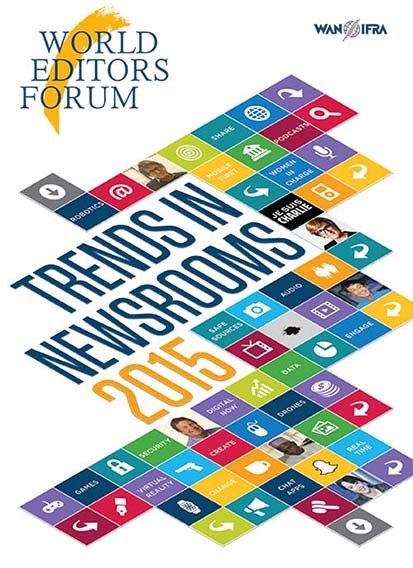 "Smartphone for news alerts, social media for distribution, websites to archive your story. Ouch!" Gamification, virtual reality (VR) and wearables are also presenting new challenges to newspapers as they try to hold on to readers whose attention spans are increasingly diverted by technology, gimmickry and an explosion of applications. Games, considered fun for young and old alike, are being used by news organizations such as the BBC, The Guardian and the New York Times to shed light on serious issues and let participants decide on outcomes. The BBC attracted controversy in early 2015 over the interactive text-based game Syrian Journey. The choose-your-own-adventure-style game allows users to become Syrian refugees fleeing the country as they attempt to enter Europe. The participant begins by selling their Damascus home at a vastly reduced price, and then makes a number of decisions to get to mainland Europe. Consequences and alternative endings include drowning and arrests. The game drew sharp criticism given the enormity of the refugee crisis, but others see it as an alternate way of engaging audiences. As if that weren't enough, newsroom managers must care for their charges' safety. Journalists and correspondents, as well as stringers and others involved in the news-gathering business, have never been as endangered as they are today. Governments, terrorists and other malcontents are targeting journalists in record numbers, including behind their own desks, such as the Charlie Hebdo attack in Paris, with press freedom and personal safety taking center stage in newsroom debates. Editors and publishers also have to worry about their sources, notably when covering sensitive topics and undertaking investigative projects. 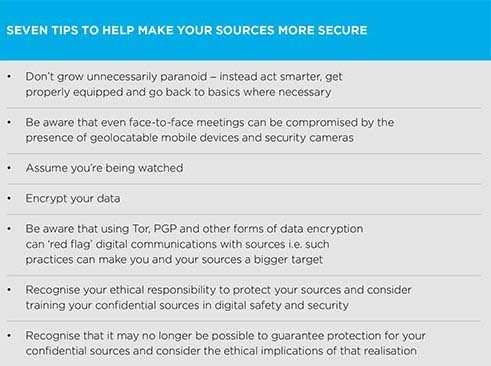 The report lists seven tips to help ensure journalists' sources' security including data encryption and face-to-face meetings to avoid leaving a digital trail, but cautions that no measure is foul-proof. 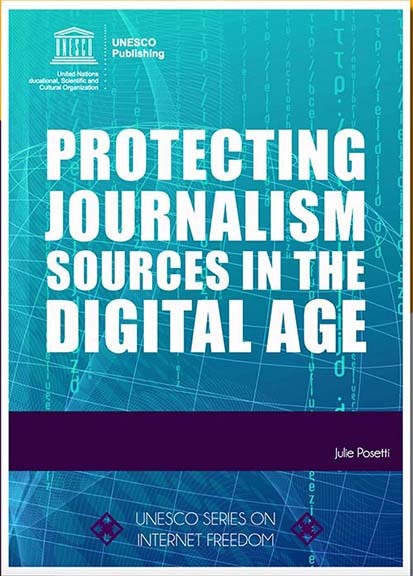 Report editor Julie Posetti, a veteran journalist, academic and research fellow at WAN-IFRA, also undertook a global study into the state of journalistic source protection. It was commissioned by UNESCO, with funding from Sweden, and support from Australia's University of Wollongong. "Protecting Journalism Sources in the Digital Age" comes in the wake of national security and anti-terrorism laws, mass and targeted surveillance and data retention policies that seem to cripple investigative reporting and scare off whistleblowers. The upshot: Assume you're being watched, listened to, tracked. Where source protection is compromised, the impacts can include: pre-publication exposure of journalistic investigations which may trigger cover-ups, intimidation or destruction of information, revelation of sources' identities with legal or extra-legal repercussions on them, sources of information running dry, and self-censorship by journalists and citizens more broadly. Systems for transparency and accountability regarding data retention policies and surveillance (including both mass surveillance and targeted surveillance) -- as recommended by the UN General Assembly; steps taken by States to adopt, update and strengthen source protection laws and their implementation for the digital era; training of journalistic actors in digital safety and security tactics; efforts to educate the public and sources in Media and Information Literacy, including secure digital communications. Another concern raised in the Trends report is gender equality, for which Bloomberg News devised a five-point strategy for change. 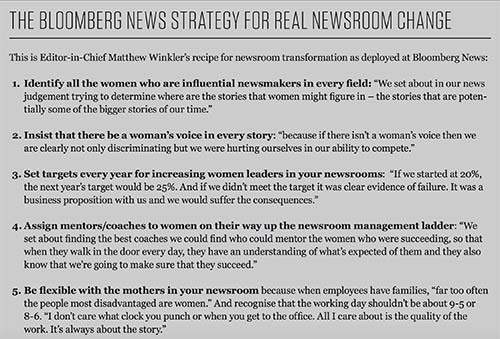 It includes identifying all women who are influential newsmakers in every field, insisting there be a woman's voice in every story, setting yearly targets to increase women leaders in its newsrooms, assigning mentors/coaches to women on their way up the newsroom management ladder and being flexible with mothers in the newsroom.